The US is "afraid" of Europe and Russia rebuilding their relations and are doing everything they can to prevent an improvement in the current state of affairs, according to French essayist Francois Jourdier, who believes Europe will become a "US satellite" if officials agree on a TTIP deal. Following an increase in speculation about whether Europe will come to an agreement with the US over the controversial Transatlantic Trade and Investment Partnership (TTIP), rear admiral Jourdier told Sputnik the American enthusiasm for the deal was part of an overall plan to further isolate Russia from Europe. "The US are afraid of rapprochement between Europe and Russia, they are doing everything to prevent it. From the very beginning they have been orchestrating the Ukraine crisis. And they want to bring to a successful conclusion the negotiations on a transatlantic agreement, which I hope will not be signed." 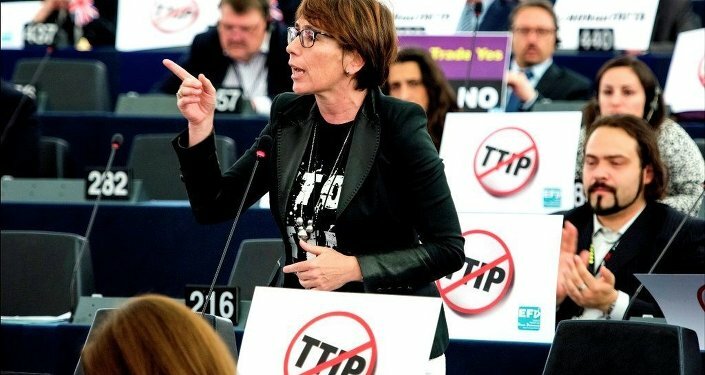 Jourdier echoed the concerns of many TTIP critics disagreeing with the manner in which negotiations have been held behind closed doors, saying that Europe will become Washington's "satellite" if a deal is agreed upon. "The situation with TTIP is rather interesting due to the fact that it is being discussed in complete secrecy. I think that, if signed, Europe will end up in a position of a US satellite." Meanwhile, following widespread public opposition to the proposals, senior European politicians have been accused of purposely postponing this week's planned European Parliament vote on the TTIP over fears it may have been rejected by MEPs. 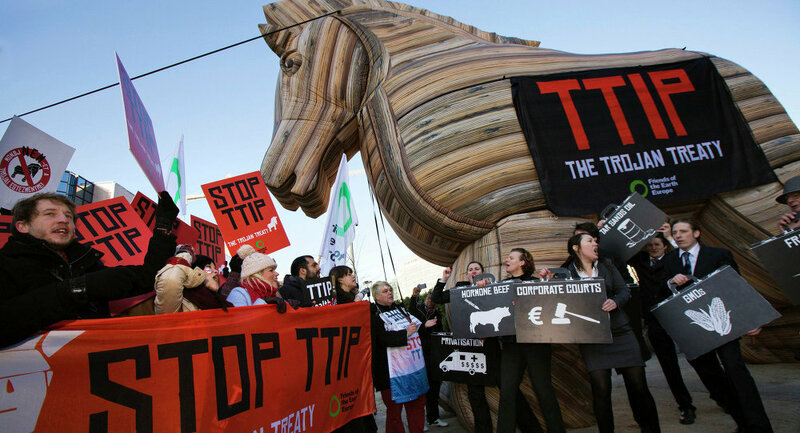 The opposition movement towards the TTIP comes from across a wide range of the political spectrum, with environmentalists, left-wing, Eurosceptics and far-right parties among those opposed to such a deal. Professor Jacques Sapir, researcher from the French Center of Industialization Studies (CEMI) told Sputnik that despite public opposition to the TTIP, the government's criticism of the proposals is being watered down due to its relationship with Germany. "The main reason is the fact that the leading proponent of the TTIP, not counting of course the United States, is Germany, and the French government is a hostage to its own idea of an alliance with Germany. "This agreement would benefit large industrial enterprises in Germany, many of which are multinational corporations, which explains the commitment of Germany to TTIP ideas." Professor Sapir even accused European Parliament President Martin Schulz of purposely postponing this week's vote on the matter. "It is for this reason that the President of the European Parliament, a German himself, Martin Schulz did not want to risk a 'no' vote but only postponed it in the hope that the powerful lobby in the European Parliament that supports the TTIP will eventually suppress the opposition." Much of the opposition towards TTIP proposals in Europe has been centered on the argument that an agreement will mainly benefit large US multinational corporations at the expense of European governments and businesses, and in turn, European citizens. There are concerns that TTIP could lead to the privatization of public services, which could see multinationals sue governments for any measures deemed to have an impact on market competition. Meanwhile, critics argue that a standardization of health and safety regulations would result in a loss for Europe, given that many American laws aren't as stringent. Political analyst general Jean-Bernard Pinatel told Sputnik that the current TTIP proposals favor the US, and that Europe isn't doing enough to protect its interests. "Obviously, in times when countries defended their own interests, when there were leaders capable of protecting them, all those treaties between Europeans and Americans were based on the principle of reciprocity in concessions. "Today, it is clear that European leaders are not doing enough to protect European interests against the interests of the US."